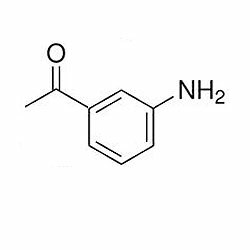 We delicately manufacture, export and supply an aromatic range of 3-Amino Acetophenone. Our range of this chemical is manufactured under the guidance of our highly skilled quality controllers, by using superior quality natural ingredients sourced from the rich and well established vendors of the market. Further, this has gained a lot of appreciation from the clients due to their features such as longer shelf life, purity and accurate composition.